In a previous post, we talked about how each brand has its own maintenance schedule as well as new types of oils and materials. The main “material” that changes the job title from “mechanic” to “technician” in the automotive industry, is the implementation of computer systems into the workings of each new brand. Mechanical parts are still in place to a large extent, and still need maintenance of course. When the industry was newer, the work was all mechanical. Elbow grease, manpower as well as the black and oily grease that stained hands and nails. Since the manufacturing and maintenance work was largely mechanical, there also grew an assumption that it was easy work…that anyone could do it. Now the industry is incorporating computer systems inside of cars, trucks, SUVs and hybrids that need updating and maintenance at regular intervals. Cars are advancing just as fast as any smartphone is right now. 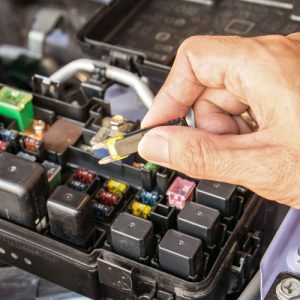 Manufacturers are coming out with new makes and models with new computerized features that each technician must learn about in order to properly service it. Auto maintenance on a new vehicle is no longer a weekend hobby that anyone can learn by trying to take it apart and then put it back together. 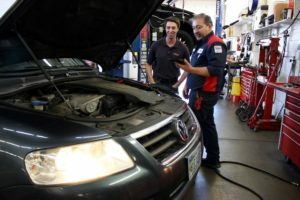 Our technicians are getting new and updated training every single month in order to stay educated and informed about how vehicles are changing and developing. Similar to a smartphone when an operating system gets an update, when you think you have one thing figured out, the manufacturer changes something and we need to learn what’s changed and what the new protocol is. In fact, every year, the whole shop closes down and we all attend a 3-day training. One unusual thing about our shop is that we pay for the cost of the training, but also the technician’s wages while they are learning. Many shops don’t even pay for a technician’s training, much less their wages. Or, a shop might send one technician, maybe a lead, but not the whole staff, like we do. Vehicles are changing and developing this fast. And we’re on top of what’s happening so we can give you the best possible service for your vehicle.